Part of the philosophy of Little League International, is that leagues are to be managed by volunteers not paid professionals. We can only be as strong as our volunteers and we are always looking for responsible and enthusiastic individuals to help support our league. Anyone can apply to become a volunteer. Whatever talents or skills you have, we can use them! Across the country, volunteers are grandparents, siblings, aunts and uncles, retirees, community leaders, former Little Leaguers, friends, neighbors, and more. Any community member who wishes to become a volunteer may apply. 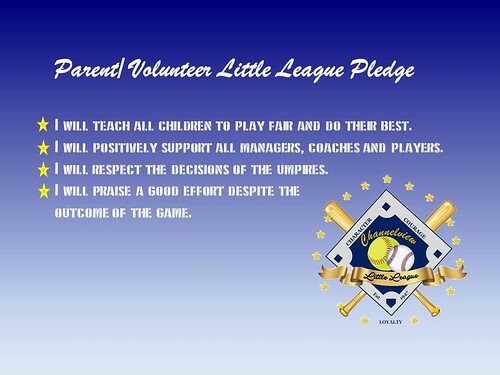 All parents of children involved in Little League Baseball and Softball are strongly encouraged to volunteer. As a parent volunteer, you have the opportunity to spend quality time with your child in a safe, fun-filled environment. Oftentimes, parent and child social lives parallel each other. Volunteering allows your life and your child's life to intersect on common ground, with shared interests and goals. If you can not volunteer at a league wide level, consider volunteering for a role in your child's team, for example an assistant coach, a Team Mom/Team Dad, or as the scorekeeper, your team manager will appreciate the help! Team Managers are an essential role in the league. With their effort, help and commitment we are able to create teams. A Team Manager is the main communicator to the League down to the parents. They organize team practices/games with the help of the parents, communicates with the parents, and most important leads a positive example for the league. There is no experience needed to fill this position, the league is striving to improve the resources given to help each volunteer succeed as a Team Manager. Field Maintenance and Concession Stand Volunteers are always always needed! If you are able to offer a lending hand, please contact us!! We look forward to hearing from you and how you will be helping out!